Manual defragmentation of you disks is possible, but since it tends to take a lot of time, it is best to schedule it to automatically run while you are asleep or away from your computer. 3. On the Scheduled Task Wizard dialog, click Next. 4. Click Browse and navigate to windows’system32 folder. Select defrag.exe and click Open. 5. On the Scheduled Task Wizard dialog, type a name for the scheduled task (for example type Disk Defrag). 6. 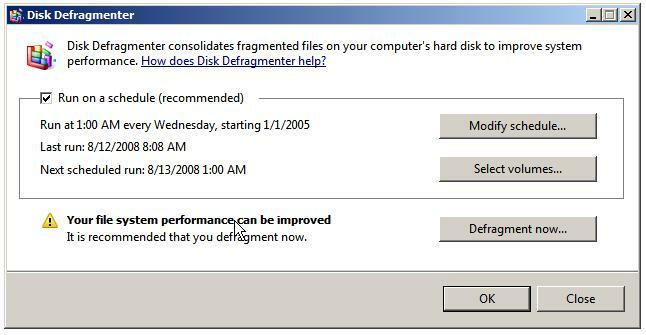 Under Perform this task, select how often you wish Disk Defragmenter to run. Click Next. 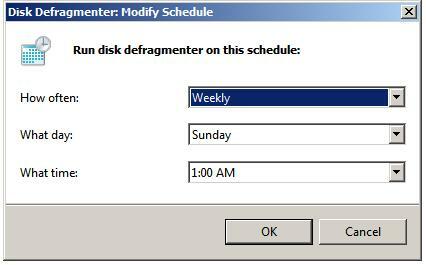 Set the time at which you wish the Disk Defragmenter scheduled task to run. This should be a time when your computer is turned on but not under heavy use (i.e. at night time).